SEOUL, South Korea North Korea has moved a missile with "considerable range" to its east coast, South Korea's defense minister said Thursday, but he added that there are no signs that Pyongyang is preparing for a full-scale conflict. The report came hours after North Korea's military warned that it has been authorized to attack the U.S. using "smaller, lighter and diversified" nuclear weapons. It was the North's latest war cry against America in recent weeks, with the added suggestion that it had improved its nuclear technology. South Korean Defense Minister Kim Kwan-jin dismissed reports in Japanese media that the missile could be a KN-08, which is believed to be a long-range missile that -- if operable -- could hit the United States. Kim told lawmakers at a parliamentary committee meeting that the missile has "considerable range" but not enough to hit the U.S. mainland. A North Korean Musudan, or Taepodong X, intermediate-range missile. The range he described could refer to a mobile North Korean missile known as the Musudan, or Taepodong X, which has a range of around 2,000 miles. That would make Japan and South Korea potential targets, but little is known about the missile's accuracy. The defense minister said he did not know the reasons behind the missile movement, saying it "could be for testing or drills." Experts say North Korea has not demonstrated that it has missiles capable of long range or accuracy. 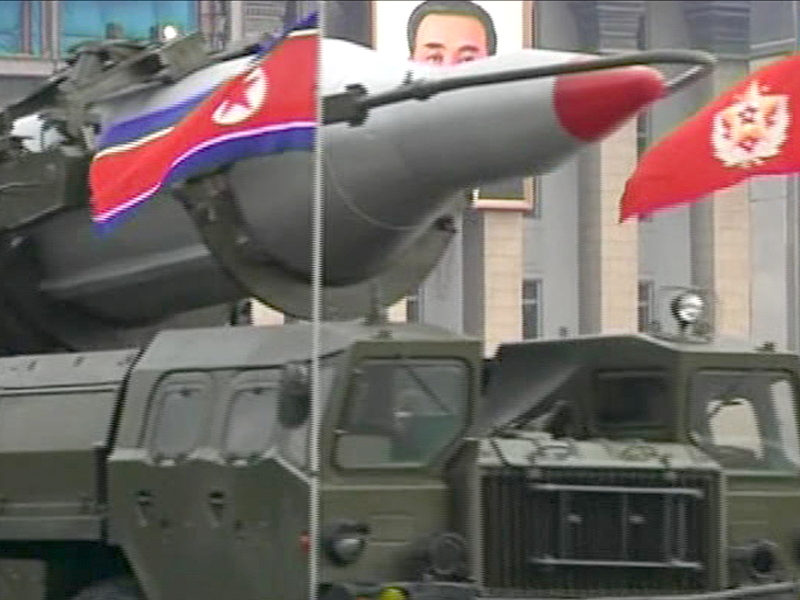 Some suspect that long-range missiles unveiled by Pyongyang at a parade last year were actually mockups. "From what we know of its existing inventory, North Korea has short- and medium-range missiles that could complicate a situation on the Korean Peninsula (and perhaps reach Japan), but we have not seen any evidence that it has long-range missiles that could strike the continental US, Guam or Hawaii," James Hardy, Asia Pacific editor of IHS Jane's Defence Weekly, wrote in a recent analysis. Kim Kwan-jin said that if North Korea were preparing for a full-scale conflict, there would be signs including the mobilization of a number of units, including supply and rear troops, but South Korean military officials have found no such preparations. CBS News correspondent David Martin reported Wednesday that the Pentagon had announced it was sending a battery of air defense missiles to the Pacific island of Guam, which recently served as a base for American B-52 bombers that flew over South Korea as part of an annual military exercise. Next week, that exercise will include an amphibious landing and live fire drills by U.S. Marines, added Martin. CBS News correspondent Holly Williams notes that, while there's no way of being certain whether North Korea's 30-year-old leader Kim Jong Un is genuinely willing to risk war with the United States, Secretary of Defense Chuck Hagel has made it clear the U.S. is taking the North's provocations seriously. "Some of the actions they've taken over the last few weeks present a real and clear danger and threat to the interests, certainly of our allies, starting with South Korea and Japan, and also the threats that the North Koreans have leveled directly at the United States regarding our base in Guam, threatened Hawaii, threatened the West Coast of the United States," said Hagel. "(North Korea's recent threats) are rhetorical threats. I believe the odds of a full-scale provocation are small," South Korean defense chief Kim Kwan-jin said Thursday. But he added that there is still the possibility of North Korea mounting a localized, small-scale provocation against South Korea. He cited the 2010 shelling of a South Korean island, an attack that killed four people, as a possible example of such a provocation. Pyongyang has been railing against joint U.S. and South Korean military exercises taking place in South Korea and has expressed anger over tightened U.N. sanctions for its February nuclear test. Many of the threats come in the middle of the night in Asia  daytime for the U.S. audience. Analysts say the threats are probably efforts to provoke softer policies from South Korea, to win diplomatic talks with Washington and to solidify the image of young North Korean leader Kim Jong Un. North Korea was allowing South Korean managers at Kaesong to return home. About 220 of the approximately 800 South Koreans who spent Wednesday night at the complex were to cross the heavily fortified border into the South throughout Thursday, according to Seoul's Unification Ministry. The North has given the rest of the South Korean nationals until April 10 to leave. On Tuesday, Pyongyang announced it would restart a plutonium reactor it had shut down in 2007. A U.S. research institute said Wednesday that satellite imagery shows that construction needed for the restart has already begun. North Korea's military statement Thursday said its troops had been authorized to counter U.S. "aggression" with "powerful practical military counteractions," including nuclear weapons. "We formally inform the White House and Pentagon that the ever-escalating U.S. hostile policy toward the DPRK and its reckless nuclear threat will be smashed by the strong will of all the united service personnel and people and cutting-edge smaller, lighter and diversified nuclear strike means," an unnamed spokesman from the General Bureau of the Korean People's Army said in a statement carried by state media, referring to North Korea by its formal name, the Democratic People's Republic of Korea. "The U.S. had better ponder over the prevailing grave situation." South Korea's Defense Ministry said its military was ready to deal with any provocation by North Korea. "I can say we have no problem in crisis management," deputy ministry spokesman Wee Yong-sub told reporters. This spring's annual U.S.-South Korea drills have incorporated fighter jets and nuclear-capable stealth bombers, though the allies insist they are routine exercises. Pyongyang calls them rehearsals for a northward invasion. The foes fought on opposite sides of the Korean War, which ended in a truce in 1953. The divided Korean Peninsula remains in a technical state of war six decades later, and Washington keeps 28,500 troops in South Korea to protect its ally. North Korea's nuclear strike capabilities remain unclear. Pyongyang is believed to be working toward building an atomic bomb small enough to mount on a long-range missile. Long-range rocket launches designed to send satellites into space in 2009 and 2012 were widely considered covert tests of missile technology, and North Korea has conducted three underground nuclear tests, most recently in February. "I don't believe North Korea has the capacity to attack the United States with nuclear weapons mounted on missiles, and won't for many years. Its ability to target and strike South Korea is also very limited," nuclear scientist Siegfried Hecker, a senior fellow at the Center for International Security and Cooperation at Stanford University, said this week. "And even if Pyongyang had the technical means, why would the regime want to launch a nuclear attack when it fully knows that any use of nuclear weapons would result in a devastating military response and would spell the end of the regime?" he said in answers posted to CISAC's website. In Seoul, a senior government official said Tuesday it wasn't clear how advanced North Korea's nuclear weapons capabilities are. But he also noted fallout from any nuclear strike on Seoul or beyond would threaten Pyongyang as well, making a strike unlikely. He spoke on condition of anonymity because he wasn't authorized to speak publicly to the media. North Korea maintains that it needs to build nuclear weapons to defend itself against the United States. On Monday, North Korean leader Kim Jong Un led a high-level meeting of party officials who declared building the economy and "nuclear armed forces" as the nation's two top priorities. Hecker has estimated that North Korea has enough plutonium to make several crude nuclear bombs. Its announcement Tuesday that it would restart a plutonium reactor indicated that it intends to produce more nuclear weapons material. The U.S.-Korea Institute at Johns Hopkins School of Advanced International Studies has analyzed recent commercial satellite imagery of the Nyongbyon nuclear facility, where the reactor was shut down in 2007 under the terms of a disarmament agreement. A cooling tower for the reactor was destroyed in 2008. The analysis published Wednesday on the institute's website, 38 North, says that rebuilding the tower would take six months, but a March 27 photo shows building work may have started for an alternative cooling system that could take just weeks. Experts estimate it could take three months to a year to restart the plant.